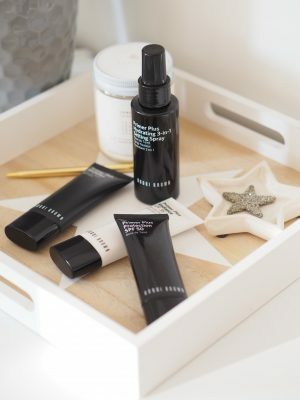 A little while ago a package from Bobbi Brown arrived with their ‘wardrobe’ of Bobbi Brown Primers. With four products each offering their own perfect prep or finishing for the all important makeup base. Having tried & tested them out and got a good idea of how I’d use each one I wanted to share them with a quick guide as there really is something for everyone in the Bobbi Brown Primer Plus range. There are four primers, two of which include SPF in their formula and two that don’t. 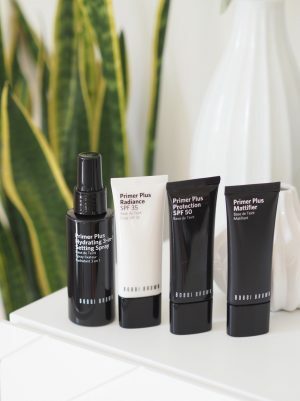 There’s the Primer Plus Protection with SPF50, Primer Plus Radiance with SPF35, Primer Plus Mattifier and the Primer Plus Hydrating 3 in 1 Setting Spray. Each of these primers is ideal for different types of scenarios or skin types. You can either use them to combat certain skin issues or challenges or you could use them to create the overall look and finish you want. So you might have issues with shiny skin over the day, so the mattifier option would be ideal or you might just want to take a glowy edge off a base and keep the look shine free. A great primer with a high level of SPF to keep your face protected. This is ideal if you’re looking for protection but perhaps don’t have a skincare product with as high a protection level for day to day. Or if you just want a belt and braces approach. SPF can make skin prone to flash back in photography so that’s one thing to be aware of with this, perhaps not one for nighttime (as you don’t need SPF at night anyway…) but if you’re out and about in the day then it’s great to see such a high level of SPF in a primer product. As a primer alone it’s a silky feeling cream that leaves skin hydrated but not greasy – perfectly prepped for makeup. I LOVE this primer – definitely my favourite in the collection. A light hydrating cream with pearly pigments in there to help give skin a glow before you add your base makeup. Works well with other bases and just gives that added bit of oomph. I like to combine this as a base with something more matte on top so I tend to get a balance of glow but not shine. Mattifying primers were the first type of primers I ever tested out. Wanting something to create a matte base at a time when shine/glow was the last thing anyone wanted with their makeup. I have now gone completely the other way and whilst I do have shine on my nose/t-zone at times,I’d rather this than dryness so tend to opt for glow/radiance options over a matte one. However, if you want to tone down shine and perhaps have an oily skin type then this could be ideal for you. It’s a silicone type of feel to it, so leaves skin with that smooth feeling base and no shine. If you have dry or combination, I’d opt for the other radiance/SPF options. A primer/setting spray combination – I do love a multi-tasker product. A light spray that can be used to prime skin with some hydration, plus spritz all over to finish your makeup. I used to think a fixing spray was a bit of a gimmick in all honesty – but I now definitely find it helps ‘finish’ everything. Especially when it comes to using powder to take away shine, but not wanting to look cakey. A quick spray of something like this that’s the perfect texture to set and not smudge makeup. Plus the fact it can be the perfect prep by adding a spray of hydration that plumps and primes, but doesn’t leave a greasy finish is ideal. 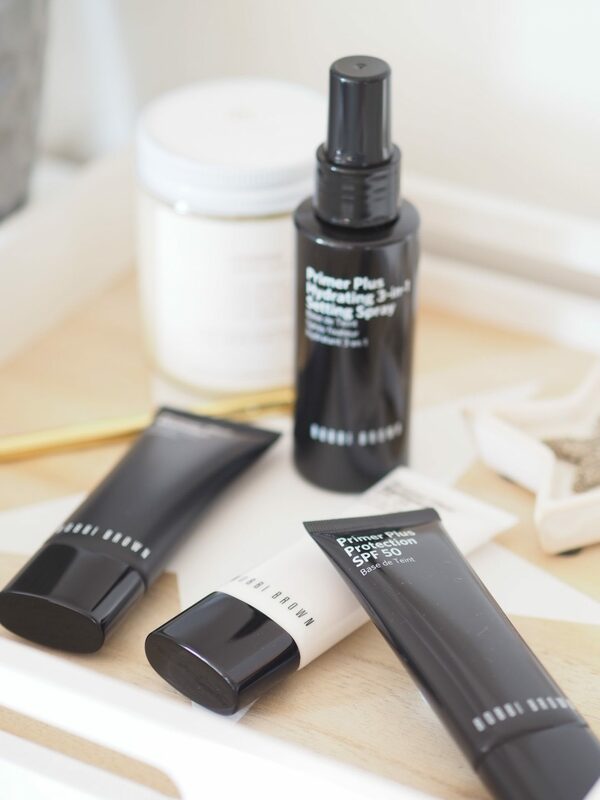 So far, this has been my most used of the four in the Bobbi Brown Primer Plus Collection.